Overall, this is a sturdy stroller for the price. The wheels aren’t the biggest, nor are the seating compartments. 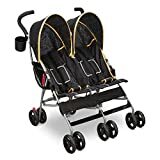 However, you can add on some mosquito netting to keep bugs off your youngsters, and you have a lot of storage even though this is a double stroller. J is for Jeep Brand Scout double stroller is still a great stroller to take on family outings to the zoo, park, lake or nature trail. On the other hand, this stroller provides decent, basic transportation for walking the mall, grocery shopping and walking to school to pick up older children. Delta Children specializes in nursery furniture, cribs, storage, maternity needs and baby strollers. As such, the J is for Jeep Brand Scout double stroller comes from a company that prides itself on delivering quality products for all of your baby’s needs. A double stroller comes in handy for when you have two young children and you have to stay mobile. 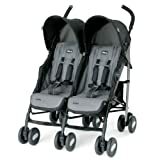 The J is for Jeep double stroller has plenty of features and amenities that make your life easier with babies. These features include sturdy wheels, plenty of storage options and a reclining seat with multiple positions for comfort. 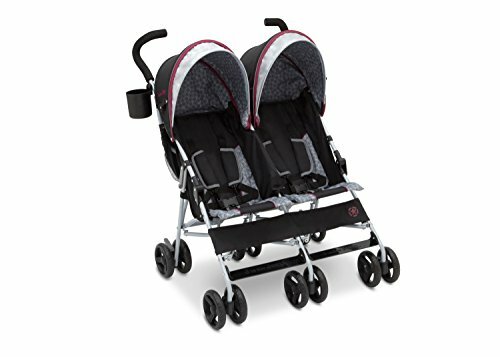 Find out through our Jeep double stroller reviews, if you were to consider this double stroller as your limo for the youngsters in your life. Most importantly, this stroller meets or exceeds safety standards for both the ASTM and CPSC. Plus, you get a choice of four colors so you can choose your favorite. Both seats have five-point harnesses to keep your kids safe inside the stroller. The shoulder straps are padded for comfort. Meanwhile, a canopy drapes over your kids to protect them from the elements. A sunshade helps prevent sunburn and overly bright lights. For night time walks, the stroller has reflective material so drivers can see the stroller with their headlights. Every wheel is 5 ½ inches wide in the front and back. The front wheels swivel and have a suspension system to handle any kind of terrain at the front of the stroller. This stroller has six sets of wheels, or 12 total, to keep everyone’s weight balanced. Each seat holds up to 35 pounds, so you have 70 pounds between both children. The manufacturer recommends the stroller for infants up to 35 pounds, but your children may reach the walking stage before they get to 35 pounds. That makes this stroller perfect for days when your youngsters just need a break from walking. The stroller fits through standard, 30-inch doorways, so that means you can take this stroller anywhere you need to go. Think school, the store, church and more. The seats have multiple positions, from sitting up straight to reclining backwards. Your kids get to see what’s in front of them or lay down for a nap, depending on their needs. This stroller is ideal for taking your kids out for a walk ahead of their afternoon nap time or sleep time. The J is for Jeep Brand Scout double stroller comes in four colors. One basic design has gray cloth with either yellow (Spot On) or green (Fairway) trim. The other two designs have black fabric with burgundy trim and white for a canopy (Lunar Burgundy), or you can go for a black fabric with a pure white canopy (Charcoal Galaxy). This double stroller is sturdy, yet it only weighs around 18 pounds. Easily lift the stroller out of the trunk of your car or the back of your minivan. This also means you can push the stroller readily down the sidewalk, street or aisle. The dimensions of the assembled piece are 23.4 inches deep, 29.9 inches wide and 37 inches high. 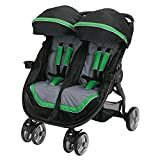 Fortunately, this double stroller folds up compactly, that way you can put it in the floor of your trunk or the back of your minivan while still leaving enough room for groceries, supplies and more. Your new J is for Jeep Brand Scout double stroller is more than just for transporting your babies. This stroller has tons of storage options for diapers, supplies and bottles of water. There’s even a cup holder for mom or dad to supply some water during those long sojourns through the park. Q: Does this stroller protect against insects? A: No, but you can purchase an additional product that attaches to the stroller as mosquito netting. Q: How far back does this recline? A: Customers report that the seat for this stroller reclines back a little bit, but not a lot. Q: How many ratings and positive reviews does this stroller get? A: Out of 185 customer reviews, this stroller has 4.3 out of 5 stars as of March 2018. Reviewers say it is sturdy, strong and holds up to everyday wear and tear.